It has been a while since I wrote News flashes on the Great Dust Cloud in 2001, but it seems the season has come again. 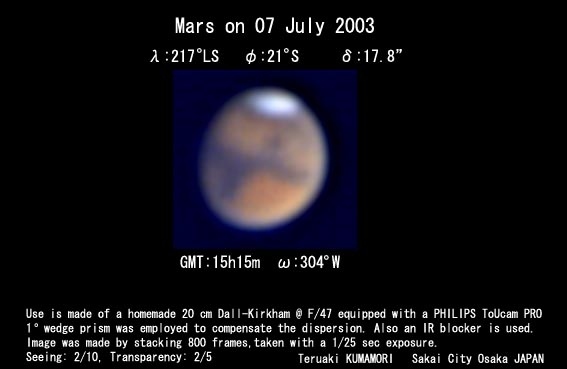 Tonight, at 15 hrs on 4 July 2003 GMT, Hiroshi ISHADOH, Shuri, Naha and I, Ameku, Naha started, with a 31 cm spec and a 25 cm spec respectively to observe Mars that was still quite low near the eastern horizon in order to check the area of Iapygia Viridis, concerning Jeff BEISH's cloud, while before that we both readily noticed a new emergence of a bright arched belt of dust having a sharp boundary at the eastern part of Deucalionis Regio, and its branch erased clearly the eastern part of S Sabaeus. The rest of S Sabaeus and S Meridiani remained dark. The area just went away into the evening thick mist at around 18:30 GMT, without changing its shape and brightness. Compared with our observations yesterday, this was a new aspect. Such an arched shape is similar to the one ISHADOH observed on 29 June 2001, but according to him the present one was less bright. As it rotated near to the terminator, the dust belt reminded me of the bar-like yellow cloud found out by Shiro EBISAWA on 11 July 1971 at Meudon at the same season. That bar-like streak should be said perpendicular to the 1956 and 1971 Noachis bar-like dust clouds. We could not see any definite trace of Hellas today, but today's final appearance of the dust belt was quite similar to the one in EBISAWA's drawing at LCM=348 degs W made on 11 July 1971. We should just repeat that this 1971a dust was clear and definite but, according to EBISAWA, it was less bright than the morning mist. As a reuslt it diffused within the following night. Another particular thing observed tonight (still ISHADOH watching however) there was seen a bright spot on the dark fringe of the spc where the dark fringe was clearly cut. The location was observed to locate near at the head of Novus Mons. I shall return to observe since the dawn does not break yet, but just say it is interesting to observe tomorrow how the Deucalionis dust belt subsides during the Martian night and rebuilds or not in the coming morning. Many thanks for the excellent observation. Jeff and I suspected that the storm was spreading westward. The best we could see was that it was covering northern Yaonis and extending into the Hellespontis. Your observation confirm's Jeff's suspicion that Sabaeus Sinus and Deucalionis are involved. It seems that the clouds still have lots of energy and rise to significant heights, judging from their brightness in the shorter wavelengths. Do you agree? Jeff and I are involved in a sleep deprivation experiment, as I am sure you are! Well, I guess the excitement keeps us young. Again thank you and the OAA members for the great web page. It is excellent and up-to-date chronicle of the storm. Hope all is well with you. Just to note that the dusty yellow projection which stayed on 4 July at the eastern part of Deucalionis R bending down to conceal most of the eastern S Sabaeus had disappeared during the night as anticipated and was rebuilt on 5 July quite differently at the western corner of Noachis just like a big swell of dust wave. The western edge was sharply defined at around 350 degs W. We watched it for five hours from 15 hrs GMT to 20 hrs GMT, while the shape remained macroscopically of the same form and the same brightness though finally it became whitish and faded into the evening thick mist. Deucalionis R and S Sabaeus were quite recovered, while the latter was slightly faded in a bluish tint (not in a dense chocolate colour). The bright spot witnessed on the dark fringe on 4 July was not particularly observed on 5 July any more. Novus Mons is now bright still inside the spc. To our regret, we cannot fully provide the ccd images taken by the Japanese CMO observers because at present the main islands are suffering from the rainy front day and night. The Saturday night seemed also not good and Yukio MORITA, one of our ccd observers, who stays at Hiroshima sent me an email at 3:30 JST (18:30 GMT) complaining about the sky. The Okinawa islands are located at the west-southernmost district and the rainy season was ended on 21 June. I am staying here from 23 June, and enjoying the higher shinning planet almost all nights, but unfortunately I am a visual observer (and narrator?) as well as Hiroshi ISHADOH, a native observer here. 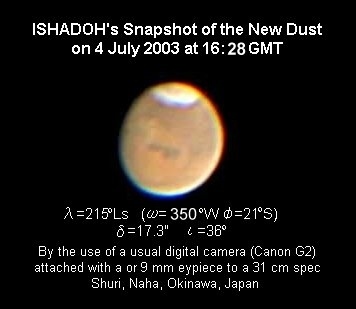 He however took an image of dust on 4 July by use of a usual digital camera which was already uploaded in our Web. I hear also Isao MIYAZAKI, who lives in a suburb of Naha, also watched visually the first light of dust on 4 July from 14 hrs GMT by his famous 40cm reflector. We began already posting every night (at least for a week) at around 16 - 17 hrs GMT a short comment in a small window in the first Façade of our CMO Web. We hope you will pay attention to it as well as to What's New corner on the Façade (at present K C PAU's nice image on 5 July at 17:30 is uploaded). Many thanks indeed for keeping me informed of recent developments on Mars via the CMO newsletters and e-mail. I noted your reference in an e-mail to your 'being an unfortunate visual observer'! May I just say that I reckon that the electronic images of planets taken by amateur astronomers are wonderful things but I for one am glad that there are still some visual observers in the amateur planetary community. May you be a fine visual observer for many years to come! The phase angle is still 35 degrees, and hence nobody can observe the very morning (like the MGS), while on 7 July we could start to watch from here in Japan from LCM =300 degs W and so we will soon be able to catch the morning aspect of the dust cores. As far as we caught the first light of a new core of dust disturbance on 4 July from our side (not detected on 3 July), it was furious enough to conceal the eastern part of S Sabaeus, and looked to possibly make an extension to the northern hemisphere as in 2001, but turned out not. On the following 5th day, the front was rebuilt in the western Noachis with a clear boundary, and looked to swirl back to the direction of Hellas. The assumed Yaonis Fretum and Hellespontus were nothing but two faded blurred spots inside the yellow cloud on the day. S Sabaeus already recovered its original shape though the eastern tail-end was not so extended southward because the area of M Ionium was cut by a bright band of dust, and rather connected with Syrtis Mj which was dark but going away. On 6 July, the dark band of Hellespontus almost recovered (the northern end was cut out), and the brighter core of dust in Noachis looked slightly shrunk, but yet it had a fat roundish core and we could expect much of this Falstaff to do something. On 7 July, however, he reappeared to have been emaciated within a day, though the wide Hellespontus again looked cut off its head as well as foot by dust, and the slimmed core lay down along the ghosted Hellespontus. Its north-western edge was bounded by a narrow band from Deucalionis R where a branch of dust was seen. S Sabaeus was normal (no more in chocolate tinge), and the desert adjacent to it looked still reddish. The brighter slimmed core is reminiscent of the cudgel-like dust emergence seen in 1956 starting from Iapygia Viridis straightforwardly to Noachis, but we are not sure this humble Falstaff is vigorous enough to encircle the southern hemisphere up to the south pole. Anyway we may be able to chase this side for a while, and really at present we are murmuring every night for the Mars observers nothing is better than to watch the dust clouds on Noachis. In addition to these we have visual observations made by ISHADOH, and they will be cited in a coming issue of the CMO. Finally we should remark that the condensates of water vapour are still active, and there is an infinite way of mixing rate of condensate and airborne dust. And so in the case of ccd observations the vast governing of the condensates including the evening side distribution should be caught in the B ingredients for later study. This is more important than the HST-like details. Thank you for your most interesting description. I enjoyed your choice of words! First of all, we should like to remark that a global obscuration of the Martian surface is going on. As is known, this is the season when the water vapour is abundant from south to north, and the water condensate mingled with airborne dust covers the Martian surface; this has been seen especially at the morning side as well as near the evening terminator as has been repeatedly mentioned. Recently the whitish water condensate can be detected also near noon, and furthermore the rate of the dust seems to have much increased, so that the atmosphere is becoming quite opaque including the polar regions. Nevertheless, Memnonia, Amazonis and Zephyria (previously Aeria) look still reddish, and so the amount of dust is not yet so large. On the other hand, some melting ice glazes at the brighter peripheral ring of the spc are now observed to send out actively water condensate or something like that northward. This kind of released water vapour must be migrated to the opposite hemisphere by the airborne dust and hence as far as the thawing speed is high the opacity should continue or increase. Hiroshi ISHADOH (31cm spec) pointed to me that the present status of the areas of Cerberus-Phlegra and the Aetheria dark patch reminded him of the status he met at the beginning of July 2001 when the great 2001 storm swept the northern hemisphere. I (25cm spec) agree with him. Yes, we are watching at present the region from M Sirenum to M Cimmerium from Okinawa. Syrtis Mj is now just going away from the western limb. M Cimmerium now shows up its details minutely, and its shape is quite reminiscent of the case in 1988, except for a few points that were caused by the devastation. By devastation, we mean the fading of some markings mainly by fallout of the dust. Previous week we watched from Hellas to M Tyrrhenum, and we saw that several parts still remained devastated since the 2001 dust storm, and the area looked very changed. Mare Hadriacum almost remained vanished, and the Northern Ausonia recovered light. The latter area was rather dark in 1988, and the southern Ausounia was bright as if the dust cloud stayed, but the present aspect rather reminds us of Ausonia depicted in the original map of SCHIAPARELLI in 1877. Because of the lightning of the Northern Ausonia, M Tyrrhenum looks strange. 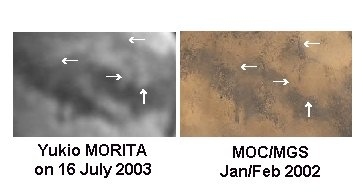 To see concretely, we here cite as Fig 1 a recent image by Yukio MORITA and compare it with a mosaic image of the MGS/MOC in 2002. The latter shows well the devastation occurred there after the 2001 dust storm, and comparison will show us what remains still devastated. Here four places are pointed (one remnant). To distinguish the obscuration from devastation, it is a way to compare the images. 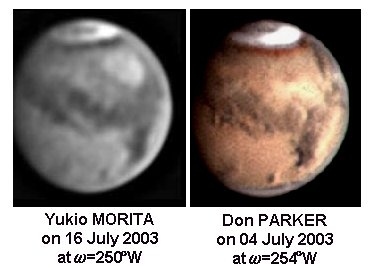 Figure 2 compares Don PARKER's important image made on 4 July with an image by Yukio MORITA on 16 July from a similar angle. This may tell us somehow the dust obscuration from the original devastation. Otherwise, any valley or fosse can survive the fallout, while they are easily faded by the obscuration. Extraordinarily we are watching Mars every night for a month running. This morning it was weather forecasted to be cloudy because of an approaching Typhoon, but it brought us a high pressure atmosphere with good seeing over here. The apparent diameter of the planet Mars is rapidly growing. Around 10 August, it will reach 23.8 arcsecs, the maximum diameter we met in the previous great apparition in 1988, and on 22 August it will exceed the great threshold 25 arcsecs whose size we have never experienced if any was not yet a Mars observer in 1924. On 27 August the planet will be closest to the Earth, and then it will rapidly go away. At present we can notice new minor markings everyday since the diameter renewed larger everyday. However since the surface at present is dusty covered by a global yellow haze made of airborne dusts and water condensates, the intensity of the markings, major or minor, is quite low and we are afraid the coming great planet may not be appealing enough to satisfy usual observers. This does not imply the aspect of the surface is not interesting: Instead the surface seen through the delicate yellow-whitish mist looks beautiful, while obscured or degraded to some extent. Though the ccd imagers alone are composing high-contrast images with Red or IR light eyes, but it is to be hoped for them to reproduce this kind of faint beauty. Now we should return to the main subject: We would just like to recall that this is the very season when the centre of the south polar cap (spc) moves out from the south pole. According to G E FISCHBACHER et al (1969), who studied the data from 1905 to 1956 of the spc thawing compiled at the Lowell Observatory, the perimeter of the spc at 230 degrees of Ls is roundish with its centre at the pole, while the centre of the one at 240 degrees Ls is deviated from the geographical south pole, and moved to the 030 degrees W direction. So Ls=235 degrees must be critical, while the data of Viking Orbiter 2 showed that the spc at 235 degrees Ls was still roundish, and the deviation or longitudinal asymmetry began from 237 degrees Ls. The analysed data at the Lowell Observatory is an averaged one, while VO-2's result is concerned with the case in 1977. So it may differ from year to year depending on the difference of the status of the Martian atmosphere, and it will be interesting to observe how the displacement begins and ends this year also. On 5 August, Ls attained 235 degrees, and on 8 August it will reach 237 degrees. We have already checked at the end of July (around 230 degrees Ls) that the following half (exactly half) of the spc was quite shadowy seen from the angles 140 - 150 degrees W (implying the rapid thawing over the half). We suppose the preceding half is similarly shadowy if seen from the angles about 290 degrees W (see for example A CHAIKIN's image on 4 August; CMO-Web). Unfortunately both angles are not seen from the Asian-Oceanian hemisphere at present, but the former will be observable at Europe, and the latter at American side. The inside of the spc seen from the angles 100 degrees W - 160 degrees W and their opposite should carefully be checked. Observation should be accompanied by the visual watching. 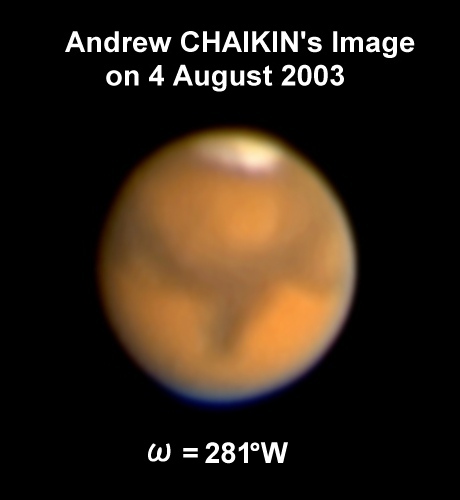 In response to your e-mail "CMO 2003 News #5" I should like to inform you that as I observed Mars last night (August 7 at 00:10 UT, with a ω of 158.3°W), I noticed that the following about-one-fourth of the SPC looked thin and shadowy. I was quite unprepared for this sight (I just read your email, and it is now mid-afternoon here), and the last time I observed - on August 5, also just after midnight UT - I did not notice anything of the kind. So your message was most pertinent, it seems... and right on the mark. 1) The Martian season has reached 300 degrees of Ls that was the very season when the great dust storm in 1973 started. It was onset as a bright small patch near Solis L. It repeated its rise and fall for a few days there gradually expanding and finally encircled the planet. Tonight (17 November 2003) we had no sign of any bright dust disturbance around Solis L, but we should recall the possibility of a bright dust burst and we should be on the alert (even at the side of Noachis). However the situation may be slightly different from the 1973 case in the sense that this time the atmosphere is not clear, but hazy by the airborne-dust/condensate mist. It is highly possible if the atmosphere receives little by little a necessary energy from the airborne/condensate haze, it may not need any catastrophe to reach the equilibrium. 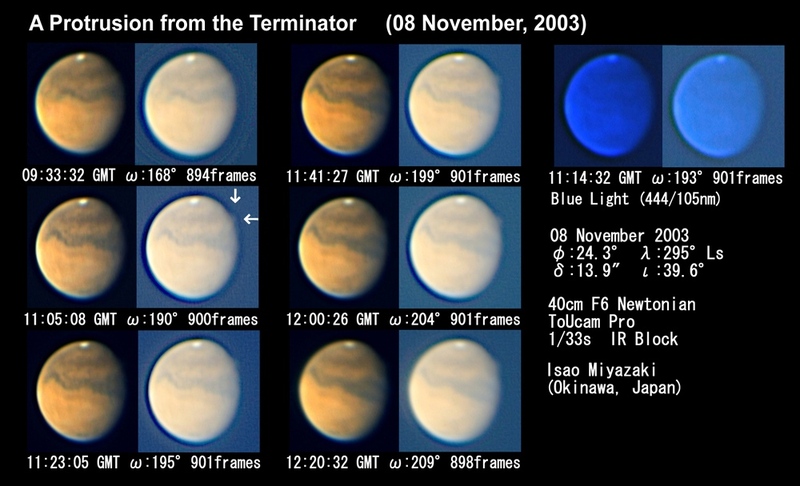 2) We recently observed an exceptionally clear projection from the southern morning terminator on 4, 7, and 8 November at around LCM=200 degs W (see Director's Note: in the CMO-Web and MIYAZAKI's ccd images on 8 November). Unfortunately, the region went out of sight from our locations, and hence we ask if the readers in Europe and America could eagerly trace and check the terminator area from LCM=190 deg W to 220 deg W. We suspect the phenomenon might have been given rise to through the fact that a magnetic anomaly around the area from Ausonia to Hellas was influenced by the extraordinary activity of AR #0486. The AR is expected to come back soon from the rear side of the Sun. 3) The summit of Olympus Mons ceased to be orographically active from mid-June 2003 (in conformity with our previous data in 1988/1990), while Arsia Mons has been different and has continued to show its cloud activity more or less up until now. According to our data in 1990, Arsia Mons was whitish cloudy at the evening side until 315 deg Ls, and so we should further in pursuit of this Arsia anomaly. Refer also to a recent article: J L BENSON and others, Icarus, 165 (2003) 34-52, which shows the results secured from the MGS-MOC data during the period March 1999 through July 2001. Meanwhile, Van Der VELDEN and VALIMBERTI detected Olympus and Ascraeus Montes as dark spots on the morning side: Their behaviour on the afternoon side is hoped to be traced on the western hemisphere. 4) Last but not least, we should recommend any Mars imager to take pictures of Mars if even in an unfavourable lull during the period from 00:07 GMT on 20 November through 05:04 GMT on 21 November. 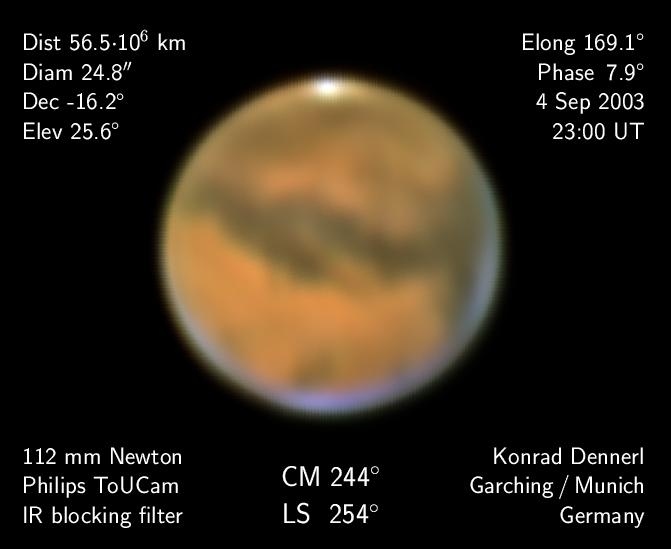 As recently Konrad DENNERL informed us (find pleased attached a file), he plans to make an X-ray observation of Mars by the use of ESA's XMM-Newton during the above period. The project works more than one Martian day and so any observer from around the world can be synchronised with XMM-Newton. Dr Konrad DENNERL is a professional astrophysicist working for the Max-Planck-Institut fur extraterrestrische Physik, Garching, Germany and in 2001 on 4 July he first caught X-rays from Mars by a detector onboard Chandra. His article was published in Astronomy & Astrophysics, 394 (2002) 1119-1128, in which ccd images by MORITA and others were used. His LtEs are found in CMO#262 and CMO#269. He owns a 4" reflector with which he shoots sometimes Venus, Mars, and others. Thank you for the CMO Notice #06. I would like to reply to your item number 2, oncerning the projection from the morning terminator. I saw Miyazaki's picture of November 8 on your website and was very intrigued by it. Clear evenings have been few in Denmark in November so far, but I have been able to observe on November 11, 12 and 17 after having read about the projection from the terminator. On November 11 (ω= 266°W), a bright cloud or mist close to the NORTHERN part of the terminator (namely, over Syrtis Major) looked as if it was irradiating slightly beyond the terminator line. South of this, a moderately bright cloud/mist over Hellas showed some internal structure (like some isolated cloudtops catching more sunlight than the rest of the cloud, particularly in the eastern part of Hellas - i.e. the part of Hellas that at the time was farthest away from the terminator), but it did not seem to project beyond the terminator line at the time of observation. On November 12 (ω= 245°W), a large morning cloud/mist over Hellas/Ausonia could readily be imagined as irradiating slightly beyond the terminator line. Yesterday evening, on November 17 (ω= 192°W), a smaller, moderately bright morning cloud/mist over Eridania/Ausonia likewise could readily be imagined to project slightly beyond the terminator line. In short - I see what you mean; even I have seen a tendency for the bright matter in the areas that you mention to look as if it projects slightly beyond the terminator. But I am far from convinced that, in my own case, we're dealing with more than an illusion. Hopefully, these "informal observations" may be of some use to you. I shall of course send my drawings to you, Masatsugu, at the end of the month as usual. The seasonally latest planet-encircling dust storm ever recorded was that which began on 1924 December 9th in Hellas. It began at Ls = 311deg. and was followed by leading BAA observers, Antoniadi at Meudon, Graff in Berlin, Pickering on Jamaica, and others. I hope that everyone will carry on until at least the epoch of the 1924 event, if not later, and continue to share their results. The weather wasn't really optimal with lots of clouds and 5/10 seeing, but since the XMM observatory was pointed on Mars and there was a request for simultaneous observations in visual light, I tried it anyway. Hadn't time to collimate the scope and during the recording 10% of the frames were dropped, but time to boot the PC to solve the problem wasn't there either.Mars looks a bit egg shaped, probably because the scope wasn't collimated properly and many selected frames have some interesting amoebe shapes too. Hopefully this image will be useful. The Mars observation with XMM-Newton is now over. I have just received the information that it was possible to perform the observation. This was not so obvious before, because the Sun did indeed become quite active. Last night I could see an auroral display, which is a very unusual event for Southern Germany (it was the second aurora which I have seen in my life; just three weeks ago I had seen my first one). I enjoyed the beauty of the aurora, but was at the same time very worried about the fate of the Mars X-ray observation. In fact, the XMM-Newton observation immediately after Mars had to be stopped because of high radiation. I do not know yet how much the data quality is affected by the solar activity, but it seems that an X-ray signal from Mars was successfully detected. Today on 13 December (315 degs Ls) at 1:35 GMT (LCM=072 deg W), Don PARKER at Florida discovered a significant dust disturbance covering a large area from a southern Chryse upto Mare Erythraeum. Furthermore the northern Argyre shows another branch of the bright dust. Margaritifer Sinus is still visible, but Don suggests the preceding Aram may be also dusty. Aurorae Sinus to its south shows still darkened patches while the area also looks curiously deformed. Otherwise the following region including Solis L is not yet affected. At present the dust development must be chased at America, and as to the preceding area, the data from Europe are expected. From the Oriental and Oceania hemisphere, the area should come into sight in a week, but we hope all are on the alert for the possible resonant leaps of dust. > as to the preceding area, the data from Europe are expected. I received the alert from yourself and Don Parker. The planet will be low in the west for UK observers to detect any dust at the morning terminator but we shall try. The event recalls 1990 November, and I suppose it will be limited to a large regional event. I understand that you have not been well, but hope you nonetheless enjoyed the Great Perihelic Opposition of 2003. Please accept my best wishes for the season, and for 2004. We hear that Tomio AKUTSU, Tochigi, Japan, observed Mars by IR today (14 December) from around 5 hrs GMT, two hrs before the Sunset and judged there had been a quantum-jump of dust observed yesterday by Don PARKER to the area of Solis L. The area of Tharsis is also limb bright in IR. We hear the images have just been processed by AKUTSU and shall soon be uploaded by MURAKAMI in the CMO-Gallery. Congratulations to Tomio. Looks like it's getting interesting! !